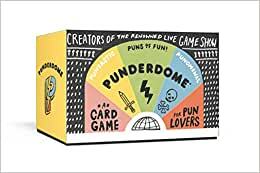 One part game, one part conversation starter, you don't need to be a pun master to master Punderdome- the goal is to make bad jokes and have fun in the process. A player (the prompter for that round) draws two prompt cards from the deck, reading the prompts to the rest of the group, who have 90 seconds to create a single, groan-worthy pun that combines the two prompts. When time is up, pun makers share their pun with the prompter, who awards the prompt cards to the player whose pun they like best. The winner then draws the next pair of prompt cards and the process repeats. Players win by obtaining 10 pairs of cards. JO FIRESTONE is a comedian and writer based in Brooklyn. Jo was recently named one of Brooklyn Magazine's "30 Under 30" and a Comedy Central "Comic to Watch." She is a regular contributor to The Chris Gethard Show on Fusion, and her radio show, Dr. Gameshow, can be heard every Monday night on New Jersey free form station, WFMU. FRED FIRESTONE is a keynote speaker and workshop facilitator for corporations across the country. His clients include Anheuser-Busch, AT&T, Enterprise Rent-A-Car and Hewlett-Packard. In addition, he developed and hosted the "SATISFACTION" game show for Ford Motor Company. When he's not working, he spends his time imitating Rodney Dangerfield and Matt Foley. 5.0 out of 5 starsI didn't play by the rules and this game ruled!! Here's how I played this game. My 3 friends and I sat in a circle, drew green and white cards, and looked at them until we had a puns. When we had one, we'd lay down our cards and say whatever silly thing we'd come up with - or if we couldn't come up with one, we'd draw new ones, no big deal! We were whipping through the deck quick as could be. About 50% of our jokes were funny, but we didn't care. It was quick, mentally stimulating, and really funny (with plenty of good pun-groans). When we ran out of cards we just shuffled and we were back in business. Did anyone win? Nope. Did we have fun? Absolutely. I had brought this game on vacation with friends and they were constantly asking to play. I cannot speak to the rules or rulebook or any of the other material contained there in as I did not read/use any of them. But if you love puns, I would 100% recommend this game if only for the well thought out and structured green/white cards which you can use for endless fun. BONUS: There are hilarious pun jokes on the back of the cards which I discovered during my 3rd play through. Just imagine for $12 you can have a great book of puns with a BOARD GAME FOR FREE. Finally - a game that restores the good name of the pun. I think of puns as the mimes of wordplay - both are unique art forms that are unjustly maligned. Clowns I get - they should be maligned at every opportunity. I enjoy a good pun, and am a big fan of Cards Against Humanity, so I thought I would give it a try. I played with a small circle of friends I call The Mosquitoes, after the Faulkner novel, and at first it was hard to get used to thinking of something clever in under two minutes. However, we adapted quickly, and once we abandoned the clever part, and let ourselves indulge in some truly tortured puns, the time flew by and we enjoyed some solid competitive merriment. Be forewarned - the ability to pun does not always correlate with braininess. Some very smart people struggle with getting the hang of punning, and others are surprisingly adept. It's lots of fun to see who has the mind for it, and for everyone to get the hang of it together. I feel smarter for having made this purchase! I want to start off by saying that I really wanted to love this game. I adore puns and all things punny, but this game was extremely difficult. My partner and I tried to play it with dozens of people and nobody really enjoyed it. These are people who excel in all things pun related. The main complaint was that the game felt forced. I wouldn't really recommend purchasing it until you've played it to decide for yourself. Loving puns isn't enough to buy this game. My extended family loves to try new games when we all get together. I bought this last Christmas for my husband, as he comes up daily with bad puns to make me groan....but he never opened it to check it out. So at our summer family gathering I brought it along. Everyone thought it looked too hard, I persisted that we needed to just try it. I had 8 takers, and about 6 who said they'd watch. We weren't strict with time limits....some puns took longer than others, but there are pun jokes on the back of each card that you can read aloud to entertain the crowd while you're waiting on that last contender to finish their pun. I was amazed at how clever some of my relatives were! Each round you flip two cards (one pile has nouns, the other pile has verbs) - you must write a pun that utilizes both words in some form or another. My husband didn't disappoint: with the words "Vampire" and "Fly" - his pun was simply "Bat"....the shortest "pun" ever. The reviews from the crowd were mixed.....while we all laughed and laughed at the reading of each contenders pun, the end-result was "this game would be funnier if everyone was drinking". Tough crowd! Let me just start out by saying that I love this game. But just because I love this game doesn't mean the people around me do too. What I mean is it takes a special subset of people to pun at the level this game requires. Do not overestimate your friends and family in their pun abilities, this game can alienate people very easily. So play at your own risk, I've had multiple occasions where people have had a bad time with this and that's no pun at all. I think this is why the show this is based on works so well, the people who participate are punning at the competitive level. If you wouldn't feel at home on the Punderdome stage then this game is not for you. Or you could do as other reviewers do and bend the rules to something more your speed. Whatever floats your goat.